A stealthy aquatic ambush hunter. It has an easygoing disposition, making it a fine choice as a first Kreature for a novice Tamer. It is able to target its prey with ease even in the murkiest water thanks to sensitive subdermal lateral lines which pick up vibrations. Although it appears soft and squishy, its ribs are able to rotate 50 degrees foreword, and are tipped with sharp, reinforced points. 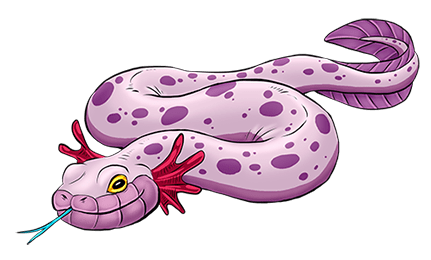 When it is under attack or coiling around prey, its ribs will erupt through its skin and impale whatever Amphisnake is wrapped around. The damage inflicted to itself by its ribs will instantly heal when they retract into its body.